Forget hygge. The original Nordic lifestyle trend was all about the ultimate comfort food: hotdogs. The Syverkiosken [pictured above] is an Oslo landmark. The low-fi, 12 m sq kiosk located near to Alexander Kiellands Plass, has been serving hotdogs every day since 1979. With prices starting from 20 Krone (£1.90), it’s one of the cheapest snack options in the city. But there’s more to the Norwegian love of hotdogs than just a cheap snack. 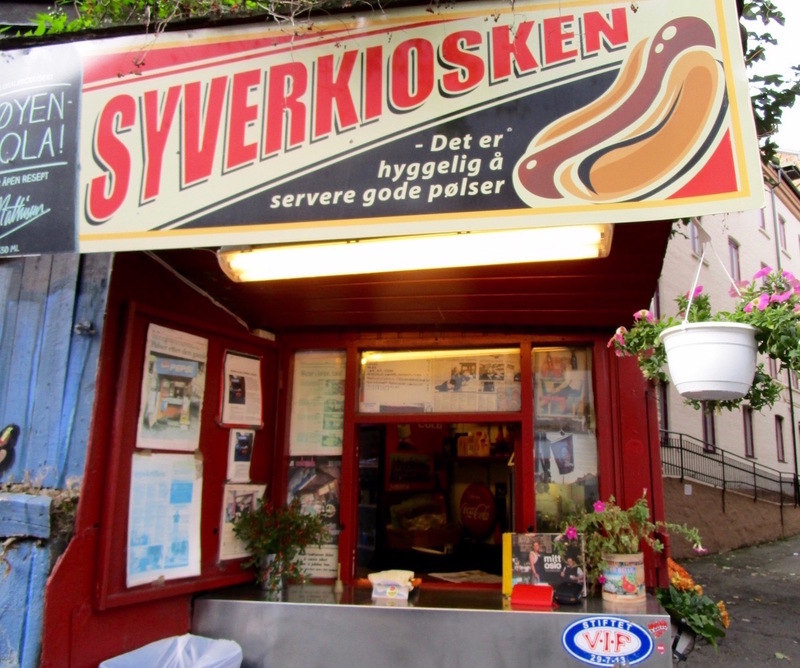 There were previously more than 40 such kiosks around town but late-opening Syverkiosken is now the last one standing, fending off cheap hotdogs from convenience stores with its family recipes and retro-fashion styling. “Hotdog kiosks have always been a part of our culture, a place where people from all walks of life stand beside each other,” says hotdog chef Elias Pellicer Ruud. Owner Erlend Dahlbo recommends using boiled wiener sausages while fried, German-style bratwurst are favored in the west of Norway. What differentiates these to hotdogs in Denmark or Iceland is the topping, a thin potato pancake to keep your dog toasty. Suitably inspired, I order The Special, a hotdog served in a bread roll with potato salad and mushrooms picked fresh that morning in the forest outside of Oslo. I pair it with a can of Toyen-Cola, a local take on Coke. The taste is comforting yet deliciously spiced with a particularly fiery brand of mustard and, when it explodes in my hands, smearing my chin with sauce, I wear it as a badge of honor. Like any self-respecting Osloite, I’m lost in a moment of hotdog heaven. This story was first published in The Guardian under the headline Hotdog heaven on the streets of Oslo. I’ve updated it to credit the quote to Elias Pellicer Ruud. It was subsequently picked up by the Norwegian newspaper Aftenposten. Liked this? Try also The Holy Grail of hotdogs in Copenhagen. The word means ‘bucket’ and reflects the style of cooking. It’s one of Birmingham’s proudest inventions and, recently, the inspiration for new culinary tours that celebrate the city’s best-loved dish. It is the Balti and, in time for British Food Fortnight, I’m in Birmingham on a blustery day to see the city through the prism of its Balti heritage. For the first leg of my Balti Break, I join Tabriz ‘Tabs’ Hussain of the Asian Balti Association for a tour of Birmingham’s so-called Balti Triangle, more precisely three streets in the city’s Sparkbrook district, home to around 40 Balti restaurants and communities of Pakistani, Bangladeshi and Yemeni families. “The Balti was invented here around 1980, adapting a Pakistani recipe for the Western palette,” explains Tabs, as we head down Ladypool Road, stopping to admire exotic fruit and vegetables for sale outside the Raja Brothers store. “Tourists never came here until a few years ago,” he adds. “Now the restaurants are packed with visitors to Birmingham,” he explains, highlighting some of the unfamiliar vegetables used in traditional Balti recipes. Down the road at the Lahore Sweat Centre, we marvel at the vibrant rows of brightly coloured sweats, including chum chum made from semolina and milk, and coconut barfi. The owners hands us samples and we relish the sugar hit. The tour complete, we then stroll over to the Royal Naim restaurant on Stratford Road for the final ingredient in our Balti experience: dinner. An informal, no-frills eatery, we sit at glass-topped tables with paintings of Kashmir adorning the walls. As I tuck into my chicken and aubergine Balti, using the naan bread to scoop up morsels of chicken, co-diner Andy Munro, author of the Essential Street Balti Guide, explains his rationale behind the tours. “It’s about unlocking the secrets of the area to foster cultural understanding via its cuisine,” explains Andy, who claims to have eaten over 2,000 Baltis and never once had a bad stomach. Most of all, it’s about celebrating great flavours. “A Balti is cooked in five minutes over a high flame and served in the same flat-bottomed wok to preserve the flavour of the spices,” grins Andy, dipping his naan hungrily. This story first appeared in The Weekend FT in 2008. Liked this? Try also Raising a glass to British Food Fortnight in Cumbria. Copenhagen really gets food this days. What with Noma and all that foraging, not to mention all those Michelin stars. But there’s a higher purpose beyond the hyperbole. 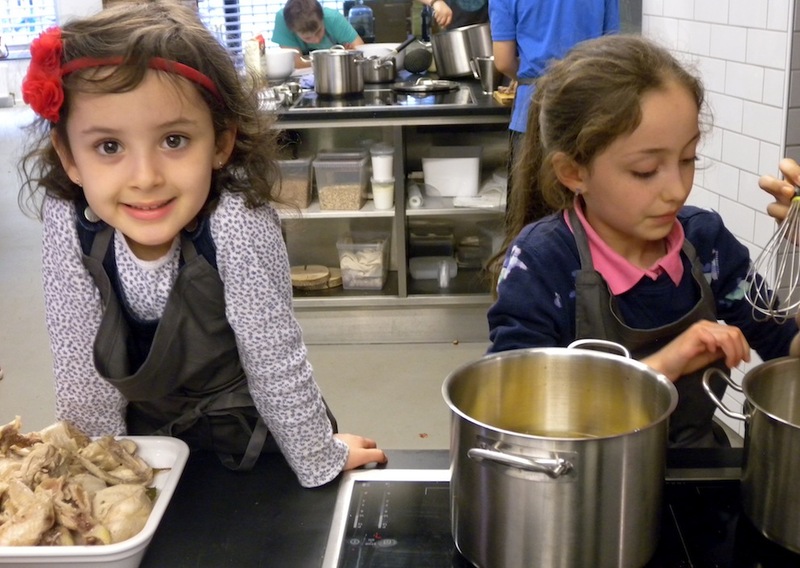 A slew of initiatives from local chefs, NGOs and government agencies are helping Danes to educate their kids about food, tackling social issues in the process. That’s why Olivia [above left], Maya [above right] and myself are just back from a long weekend in Copenhagen. It wasn’t all hotdogs and fairground rides at Tivoli. We also rolled up our sleeves and joined a cookery class at Meyer’s Madhus, the cooking school founder Claus Meyer, a leading light in the New Nordic Kitchen movement. The full article will appear in Family Traveller magazine in July to preview child-freindly events at the Copenhagen Cooking Festival in August. Back in the kitchen, things were hotting up. With 30 minutes to complete the two-course meal, Maya was busily adding lemon juice to the simmering rhubarb while Olivia helped head chef Matte to thicken the sauce for the chicken. Across the kitchen, 12-year-old Tobias, a veteran of Meyer Madhus’ cookery classes, was chastising his team of three teenage boys for burning the butter with a fiery flourish worthy of the young Marco Pierre White. But, just like a scene from the kitchen at Noma, the service comes together at the last moment and we all sit down to eat around a large, communal table and toast our success with glasses of organic juice. Plus you can find a set of images from the trip at my Flickr page. It’s a wintry night in Antwerp as I arrive off a late flight with a growling stomach. Wandering the cobblestone streets of the old town in search of a snack, my eye is drawn to the Art Deco-style sign for Frituur No 1 [pictured above], a small fast-food restaurant just off one of the main squares, Grote Markt. The aesthetics may be simple and the cutlery plastic, but my first taste of genuine Belgian fries comes as a revelation. A glorious juxtaposition of crispy exterior and a buttery-soft inside, the fried potato strips are hearty, comforting and deliciously tangy, served with a dizzying array of dipping sauces. I am instantly hooked. 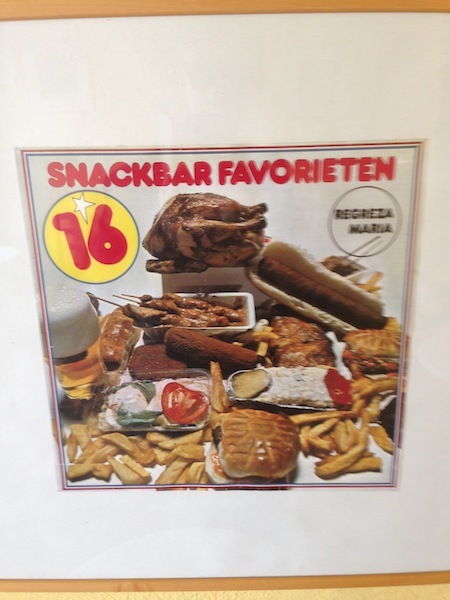 While the British may be savouring a fish-and-chip supper to mark the forthcoming National Chip Week in the UK, the Belgians celebrate their fries, or ‘frieten’ in Flemish, the entire year round. The Dutch-speaking Flanders region of northern Belgium is home to the very finest frituur, a simple, informal eatery and a Belgian institution, where master friars prepare superior fries and serve them in a paper cone. The best fries are prepared from Belgian Bintje potatoes, cut to a length of 11mm and fried twice for extra crispiness. Antwerp alone boasts over 200 frituurs and they are seen as a place where people from walks of life can come together amongst Formica tables and plastic sauce dispensers to chew the fat. Every town in Belgium has a frituur and many Belgians will still eat a take-away supper from the frituur at least once a week, with Thursday night and Sunday lunchtimes the most popular times to visit. Belgium may be divided along linguistic and political divides, but all people are equal when it comes to standing in line at their local frituur. We meet in his dark Antwerp study, where old paintings are stacked against the wall and a selection of dusty books scattered across the coffee table. “There were already street kiosks selling fries as food for the poor when Belgium was founded in 1820. But all the kiosks (frietkot) have since been replaced by small cafes (frituur),” he explains, handing me copies of his books to browse, amongst them Frietgeheimen (Secrets of the Fries) and Het Volkomen Frietboek (The Complete Fries Book). To learn the secret of cooking the perfect Belgian fries, I head for De Twee Vuistjes (The Two Fists), a name whispered in reverential, hushed tones amongst Antwerp’s chip-eating cognoscenti. Here, against the garish backdrop of posters advertising such exotic delights as the berepoot, a meat kebab, vlampijpen, a spicy beef sausage resembling a small dumb bell and bitterballen, meat-filled fried balls, Kosovo-born Uka Gashi is busy heating the oil for the first batch of chips of the day. After a second dip in the hot oil, Uka sets me loose on the fries for the final, crucial stage: tossing. Under his watchful eye, I flip the fries in a stainless-steel cullender to drain off the excess fat and leave a perfect batch of crispy fries ready to be devoured. They are accompanied by a meaty snack and dipped into one of 15 available sauces, ranging from mayonnaise to tartar via a selection of Belgian pickles. 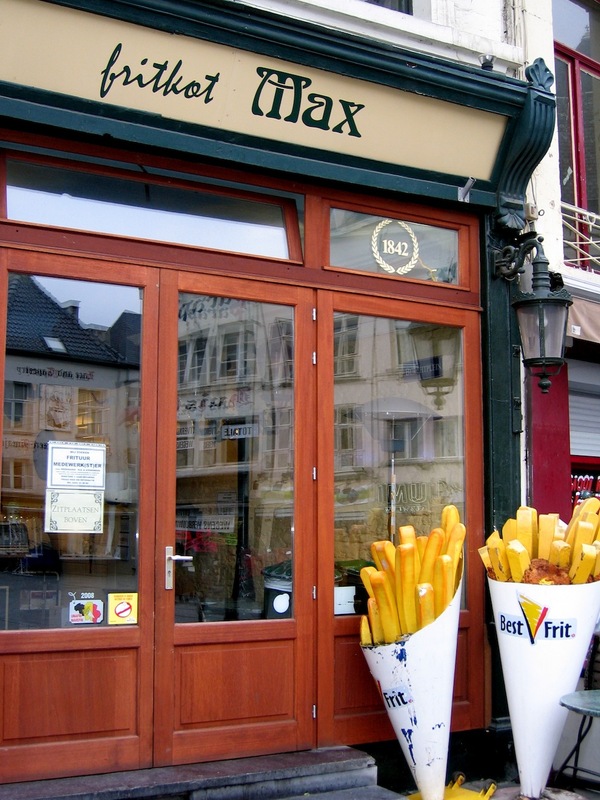 After a snack lunch of fries and bitterballen with Uka, my tour of Antwerp’s frites-frying hotspots continues with a visit to Frietkot Max on Groenplaats. It’s the oldest frituur in town, dating from 1842. Here the tiny, upstairs dining room is devoted to artworks celebrating the history of fries with the current exhibition featuring a cheeky update of Antwerp-born Rubens’ 1597 painting of Adam and Eve. The modern-day take on the Baroque painting features Adam seeking to tempt Eve with a cone-shaped bag of chips. The last stop is Hauta Frituur on in the fashionable Het Zuid district. A new breed of frituur, this eatery aims for a higher-end clientele with Arne Jacobsen-style chairs, funky plastic tables and modernist artworks on the walls. “We have a culture of uniformity with globalisation sweeping across Europe, hence I love the frituur for its aesthetics and its sense of individual freedom,” says Paul Ilegems, as we sit with cones of piping-hot fries in a neighbourhood frituur, watching the world go by. National Chip Week runs February 16-22 in the UK. This article was first published in the Weekend FT in January 2008. Liked this? Try also Antwerp: opening of the Red Star Line Museum.